Smart Security Solutions and the Future of Residential Security - VIA Technologies, Inc.
Property owners have typically relied on a mixture of traditional security methods to safeguard their homes and businesses, these involve the use of door locks and keys, simple security alarms, doorbells and intercoms. Recent advances in technology are allowing us to update and improve traditional security methods, creating a new breed of security product that offers advanced and intelligent, enterprise-grade surveillance to everyday consumers. Let’s a take a look in more detail. Today, most of us are relying on the convenience of smartphones and apps to simplify so many aspects of our everyday lives. This is now also true of residential security which now offers people the power to monitor their property from any location by using a standard iOS or Android smartphone. The move from traditional to smart security systems aligns with consumer demand for instant access, increased convenience and of course in this case, lower risks of burglaries and break-ins. 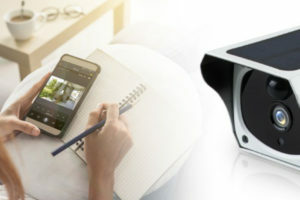 To meet the demands of today’s consumers, VIA has developed the VPai family of Smart Security solutions which includes the VPai Solar IP Camera, Smart Lock, and Smart Doorbell. These products leverage several core technological advances which include Motion Detection, Night-Vision and HD Video Recording. Perhaps more importantly however, they all give the user direct access to their home security system through the VPai Home App. Live and recorded video streams are synced with the app, enabling instant access over a secure Wi-Fi or 4G network. The VPai Smart Lock was designed to offer a much more intelligent way of deciding who has access to your home or business, and combines multiple levels of security authentication in a single, easy-to-use system. Authentication options include fingerprint recognition, NFC and password access via a front facing keypad. By combining three authentication and access methods, the VPai Smart Lock makes access easier than ever, while also offering an extremely robust locking system that ensures your property is safe at all times. Having three options to get into your home also offers safety of mind for people who may misplace an NFC key, or forget a password occasionally. The lock itself is tamper-proof. Any attempt to bypass security will result in the triggering of an Anti-Dismantling Alarm which alerts people in the immediate vicinity, as well as the homeowner via alerts to the VPai Home App. A live video recording of the incident will also be saved in the app’s Cloud Storage and made accessible to the user. Find out more about the VPai Smart Lock here. The humble door bell has also evolved to integrate network and surveillance features that make it much more aligned to modern life. The VPai Smart Doorbell offers HD video recording, motion-activated alerts, two-way audio and night vision – features that are a far cry from a traditional door-mounted buzzer. These new features allow homeowners to interact with the person at the door via both audio and live video stream – meaning users can see for themselves who is on their property. Using a passive infrared (PIR) motion detector, homeowners can be alerted to any activity on their doorstep. The doorbell features a Live-Recording feature that automatically captures events outside the property in the event of a motion alert. An alert is sent to the user via the VPai app so they can see exactly what is happening, and decide how best to respond. Find out more about the VPai Smart Doorbell here. Until recently, CCTV security systems were confined to large residential complexes, government buildings and commercial properties. This is perhaps not surprising, as CCTV infrastructure typically requires substantial investment, the installation of data and power cables, regular maintenance checks and a capable and trained security staff to monitor footage and respond to threats. However, new products like the VPai Solar IP Camera are offering a wholly new approach that involves a fraction of the cost, far fewer installation headaches and simplified control of video feeds. Featuring a Full HD video camera and connectivity support to any secure Wi-Fi network, the VPai Solar IP Camera also incorporates a solar panel, making it entirely cable-free – a major boon when it comes to installation. The addition of solar power not only reduces overall energy consumption, it also makes it an ideal surveillance solution for deployments where access to power is limited or impossible. As with other products in the VPai Security family, the Solar IP Camera works with the VPai Home App to send HD Video alerts to the consumer’s phone when motion is detected whilst simultaneously recording footage of the scene. The camera’s Night Vision mode also enables high quality video footage, even when it’s dark. Lower in cost, cable-free and independently powered by the sun, products like the Vpai Solar IP Camera will soon replace outdated CCTV systems while also making their way into homes and small businesses operations. Learn more about the VPai Solar IP Camera here. You can also learn more about the evolution from CCTV to Solar IP camera here. The transition from traditional to smart security systems is enabling radically better security. This challenges the idea that a solid security system is expensive and perhaps unattainable to the average person. Today they are cable-free and Wi-Fi-operated while also being much more affordable and accessible to the consumer market. Written by Charlotte Lawrence, Intern at VIA Technologies, Inc.